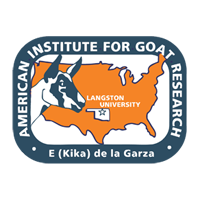 A study was conducted to determine effects of grazing of mixed grass/forb pastures at three stocking rates (SR) on subsequent performance of goats and sheep fed a concentrate-based diet. Experimental periods, in 2002 and 2003, were 15 weeks in length, following 16 weeks of grazing (May to September) of pastures with warm season grasses and various forbs. Sheep (Katahdin) and goat (≥ 75% Boer blood) wethers were 4 to 5 months of age when grazing began. Stocking rates were four (SR4), six (SR6), and eight (SR8) animals per 0.4-ha pasture, with equal numbers of sheep and goats and three pastures per SR. Two sheep and two goats from each pasture were used in the subsequent confinement period, with initial BW of 25 × 0.6 and 23 × 0.5 kg, respectively. Average daily gain by all animals during grazing tended to decrease linearly (P < 0.10) with increasing SR (61, 51, and 47 g/day for SR4, SR6, and SR8, respectively). In the period after grazing, DM intake tended (P < 0.10) to be affected by an interaction between SR and year (year 1: 958, 966, and 1011 g/day; year 2: 1109, 904, and 930 g/day for SR4, SR6, and SR8, respectively (SE = 56.8)). There was a tendency (P < 0.07) for an interaction between SR and year in overall ADG (year 1: 172, 160, and 177 g; year 2: 193, 135, and 141 g for SR4, SR6, and SR8, respectively (SE = 12.6)). Sheep had higher overall ADG than goats (193 vs 133 g; SE = 7.9). Gain efficiency (ADG:DMI) was not influenced by SR (P > 0.10). Energy expenditure (EE) measured in weeks 3 and 9 via heart rate increased linearly (P < 0.05) with increasing SR (562, 589, and 628 kJ/kg BW0.75 for SR4, SR6, and SR8, respectively; SE = 16.4). In conclusion, SR had no impact on ADG of sheep and goat wethers consuming a concentrate-based diet subsequent to the grazing period, which may involve effect of prior SR on subsequent EE.